San Jose city councilmembers get paid to represent their districts and they do this by being involved in their communities. That’s why there are elections. But when public money is funding councilmembers’ tickets to community events the question becomes: What constitutes outreach versus socializing? It’s a question NBC Bay Area began asking when looking through council spending records over the last year and finding the word “ticket” popping up hundreds of times. The Investigative Unit uncovered councilmembers spent $46,735 over the last year on admission to charity and community events -- from wine tastings to black-tie galas with ticket prices costing up to $500. And it’s all permissible under current city policy. The policy also allows councilmembers to take a spouse or date paid for by the city. The city calls this type of spending “constituent outreach," which is defined as communications with constituents that promote public awareness of city functions and programs. Spending ranges from postage to food for community meetings to tickets to events. About $10,000 for constituent outreach comes from the HP Pavilion Naming Rights agreement signed in 2000. Part of the contract gives annual funds to each district to spend on educational, recreational and cultural purposes. In 2008, the city attorney approved event tickets for councilmembers as an acceptable charge for the funds. City policy also allows event tickets to be purchased from the general fund. So if councilmembers exhaust their HP funds, they can also use their taxpayer-funded budgets to buy tickets. Over the last year, District 3 councilmember Sam Liccardo spent the most: $9,984.36 on tickets. That includes the San Jose Sports Hall of Fame Dinner at $175 for a ticket and the Signature Chef’s Gala put on by the March of Dimes with $250 to get in the door. To both events he took his fiancé as a date and the city paid the tab for the pair of tickets. He told NBC Bay Area in an interview he often shows up for 15 to 20 minutes to show his support for the nonprofit, then leaves. When asked if public money was funding his public appearances, Liccardo responded: “I think it’s part of our job as elected officials. People expect their councilmembers to be out in the community." “The cost is often quite substantial, that’s the nature of a fundraiser." When asked about the funds paying for his fiancé to attend as his date, he told NBC Bay Area, they don’t get to see each other very frequently. Even though councilmembers can’t spend public money on alcohol and entertainment, spending it on tickets to exclusive events that serve it, is allowed. NBC Bay Area asked the councilmember if he could go to free events to promote community involvement, instead of ones that require purchasing expensive tickets. “I can assure you there would be no possible way for an official to attend any of these events on my salary and still be able to pay a mortgage in the city of San Jose,” Liccardo said. District 4 Councilmember Kansen Chu spent the second most on tickets last year ($9,072). He took his wife to most of them, including “Sampling with the Sharks,” put on by the Sharks Foundation. That’s $225 for a ticket to drink wine with the Sharks players. Chu told NBC Bay Area he doesn’t drink but instead, goes to support the organizations that are part of his community. The Investigative Unit found 30 percent of the ticket sales pay to put on the event. “Sometimes it’s a little bit pricey, but I’m hoping a greater donation from my end will help give greater things for the community,” Chu said. District 6 councilmember Pierluigi Oliverio also attended “Sampling with the Sharks” last year. He also spent the most on a single ticket: $500 to attend San Jose Museum of Arts Gala. NBC Bay Area cameras show him in a front row seat, drinking a glass of red wine at Cabaret Night, a benefit for the Children’s Musical Theater. 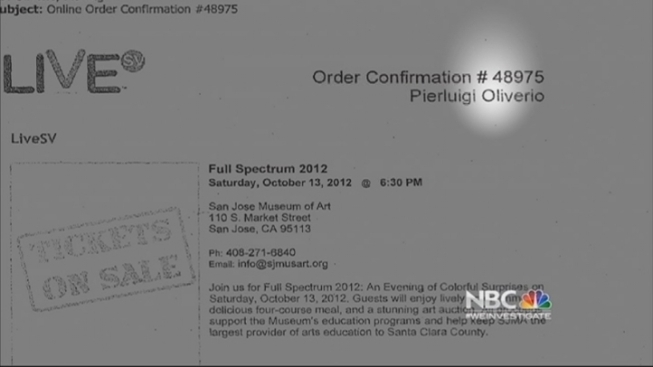 The $150 ticket got the councilmember a three-course meal, a show and wine. One event attended by Oliverio, Liccardo and Chu was the Hoot and Howl event put on by the Happy Hollow Foundation, which supports the San Jose Zoo. Tickets cost $125 for the event which features a DJ, dance party (complete with glow sticks) and bar. Heather Lerner, who runs the foundation, told NBC Bay Area the event is more about friend-raising than fundraising. Lerner would not reveal how much money from ticket sales actually goes to the foundation or how much it cost to put it on. She did say that the foundation pays for the alcohol. “We give you a cocktail and we say, come have fun,” Lerner said. However, former city councilmember Forrest Williams told NBC Bay Area, tangible benefits to the districts should come from attending these events if public funds are being used. “If they say they are going to benefit there ought to be some basis to show what the benefits are. That’s the key,” Williams said. Williams served on the council from 2000-2008. He told NBC Bay Area the constituent outreach HP Pavilion naming rights funds were intended for uses that would directly affect the district communities. He said he disagrees with the city paying for a spouse to attend alongside councilmembers.